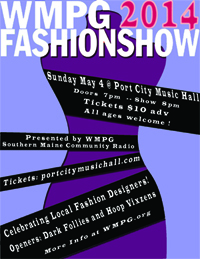 WMPG’s 10th annual Fashion Show was lots of fun at Port City Music Hall! Videos now available of show! Thanks Foo Crew! Another huge thanks goes out to everyone who came out and supported WMPG at our 10th Annual WMPG Fashion Show Benefit! It featured local fashion designers presenting their works in a fast-paced, high fashion setting with a hometown touch. It all took place at Port City Music Hall in Portland. The show included entertainment by Dark Follies Vaudeville theHoop Vixzens plus live music by The Moodiest. A huge thanks to The Foo Crew who were there and filmed the entire show and produced these videos! Missed the show – check out the videos! The WMPG Fashion Show features creations from local designers presented by local models. From casual to formal clothes, accessories and more all crafted by local artists. Wild and daring, or sweet and sassy, our local designer community never fails to dazzle the Fashion show audience. WMPG Artistic Director Cindy Flanders put together an amazing show, MC Cat Smith kept the models moving in stunning fashion and Technical Director Pete “DJPJ” Paraskevas produced the best WMPG Fashion Show ever! Nothing would have happened with them! All proceeds from the Fashion Show benefited WMPG Community Radio. For more information about WMPG’s Fashion Show Benefit, contact Dale Robin Goodman at 207 780-4151 or development@wmpg.orgor Cindy at Fashion@wmpg.org. We also had a silent auction which included generous donations from Queen of Hats, Caravan Beads, Lovell Design, Portland Pilates, Life is Good, aDiya Fine Jewelry, Caiola’s Resteraunt, The Downeaster, Street & Co. Restaurant, Hot Suppa, Asmara Resteraunt, O2 Salon, Corey & Co., Fisherman’s Grill, Maine Rock Gym, The Sun Room, The Yoga Center, Ferricchia Hair Salon, Joseph’s, Fabu Salon, Momentum Barber Shop, Monkey C Monkey Do Adventure Park, Bertini, Aristelle Fine Lingerie. Click here for a Portland Daily Sun feature on the show! Click here for full list of silent auction items available!